Today is shopping n food day. Sort of like a slow down day for me. In the morning, Joe n I went down stairs of the apartment look for breakfast. 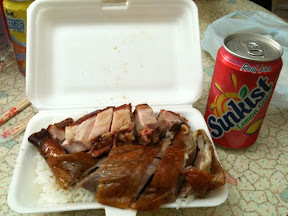 We saw roast meat shop, so Joe had cha siu (roast pork)rice n I had siu ngor bei n siu yok(goose thigh n roast pork belly) rice. So damn full. Then went to had another breakfast with Cecile, her dad n Alan. Yeap, Joe n I had 2 breakfast. Alan didn't know we had our breakfast, so they invited us. We don't mind having another meal haha cuz we like to try as much food as we can! We were so full after that. After that Alan Cecile Joe n I went shopping. They were very nice, bring us around n took care of us. Everything in hong kong is quite cheap! Joe had a huge shopping spree again! I only bought 2 pairs of flats n a top for 300hk dollar. 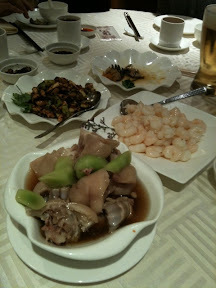 For dinner, alan's family treat us shanghainese food. interesting for me. As in flavour n way of cooking. First time in my life had raw crab. After dinner, we went to alan's parents house to visit. His parent even gave us ang pao! So nice of them!! They were really nice people. After that went to alan's sis house to chill out. Had wine n some high class cakes! 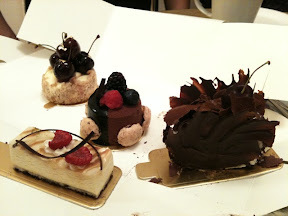 Cakes were from hyatt hotel. No doubt the cakes were awesome. Nice n relaxing day. 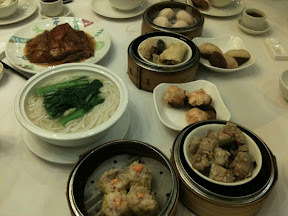 Had a very good experience in hong kong. Tomorrow will b going to Disney land!!!! Yay!!! I eat til beh tahan!